Arloa has been pole dancing since 2011 and is a cast member of the internationally renowned “Girl Next Door-A Pole Soiree”. She is based in Los Angeles and is an instructor at The Choreography House (2013 International Studio of the Year) and Luscious Maven. Arloa has an athletic background, which includes gymnastics, dance, cheerleading and tennis, and a performance background as a working actress. Discovering pole changed her life as she is able to combine her love of performance, art and athleticism into a single passion. She knows first-hand how fulfilling, empowering and freeing pole dancing can be for women of all shapes, sizes and backgrounds and is committed to sharing the joy of pole with others. 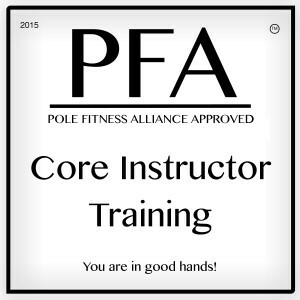 Arloa leads PoleMoves instructor training and certification workshops in the Los Angeles area. If you have at least one year of teaching experience at a pole studio which includes safely teaching inversions, take advantage of our Level 1 Pole Moves Certification “Test Out” program and get on the Pole Fitness Alliance list of approved instructors from the comfort of your own home or home studio!